I recently acquired a 3 piece Starrett Combination Square set with 24” blade for free! It’s in pretty good shape, just a little clean up is needed. I can’t for the life of me unstick the protractor though. It doesn’t look corroded where it rotates, but no amount of oil and pressure I can safely apply seems to be helping. Any ideas? One of my combinations squares sticks like that also. I find that if I unscrew the knurled knob a turn or two then push it down very hard towards the rule it will loosen up. it can take quite a bit of force to break it free. In my case, the little tab that rides in the groove of the rule is damaged and tends to stick/jam. Worth a try. Take that thumbscrew out that you can see the end of in your pic that holds the rotation. 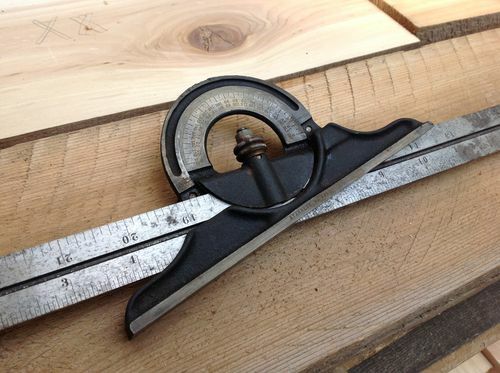 You should be able to push out the circular insert in the center of the protractor. Sometimes it takes a bit of oomph. Make sure you have the stem completely removed that grabs the blade first. I’m assuming it rotates. If it doesn’t even do that soak it with kraxit and let it sit overnight. Free up the rotation first using the blade as leverage. Then pop it out. I’ve cleaned up more of those than I can remember. That one doesn’t look too bad. If all else fails, heat. It would be my last resort because those rules are hardened steel and it could throw them out of whack or even ruin the temper. But at some point you have nothing to lose. You might try contacting customer service at Starrett. They might be able to tell you how to free it up. Customer Service isn’t a bad idea. I’ll give that a try.